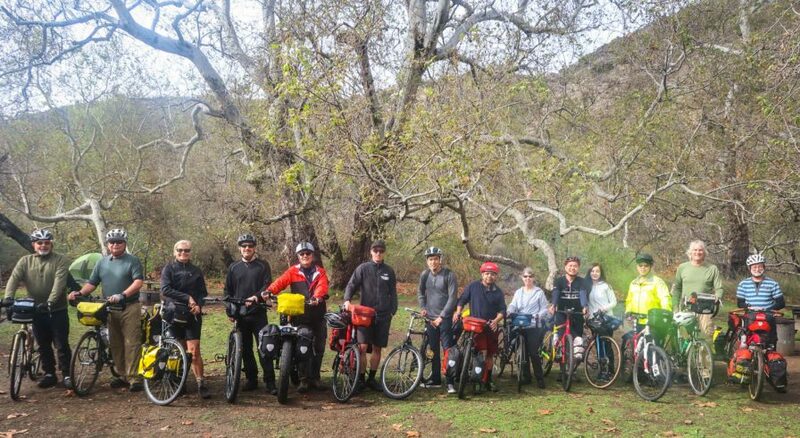 On Saturday, March 10th, 2018, thirteen of my Bicycle Touring Pro readers from all across the state of California gathered at my parents’ home in Camarillo, California and together we cycled 20 miles down the Pacific Coast to a nearby state campground called “Sycamore Canyon Campground.” Once there, we set up our tents, lit a campfire and ate burritos around a picnic table before calling it a night and going to bed. 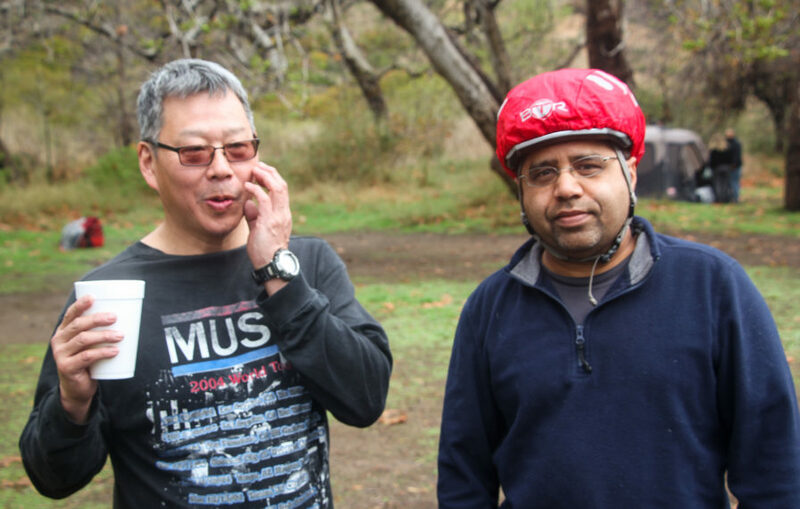 Then, in the morning, we woke up, packed up our bicycles, and cycled 20 miles back into Camarillo. 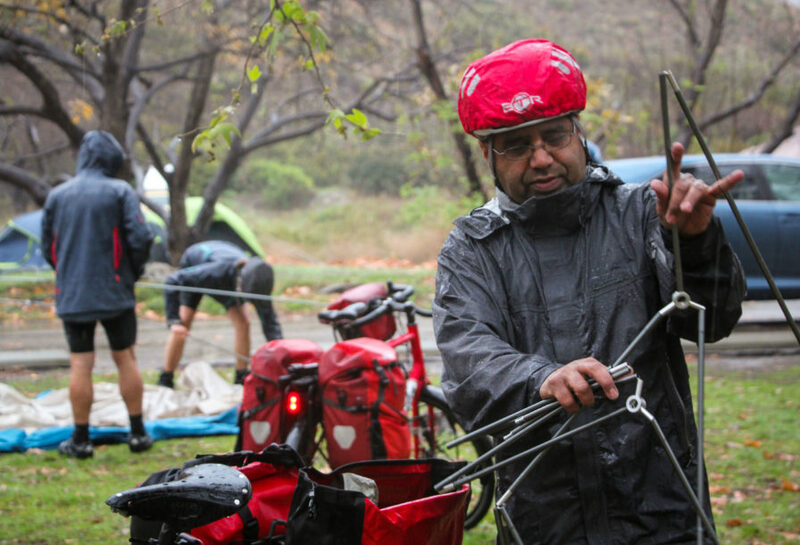 It was the first ever Bicycle Touring Pro “Bikes & Burritos” Overnight Bike Tour… and despite the poor weather on day one, I think it’s safe to say the event was a smashing success! 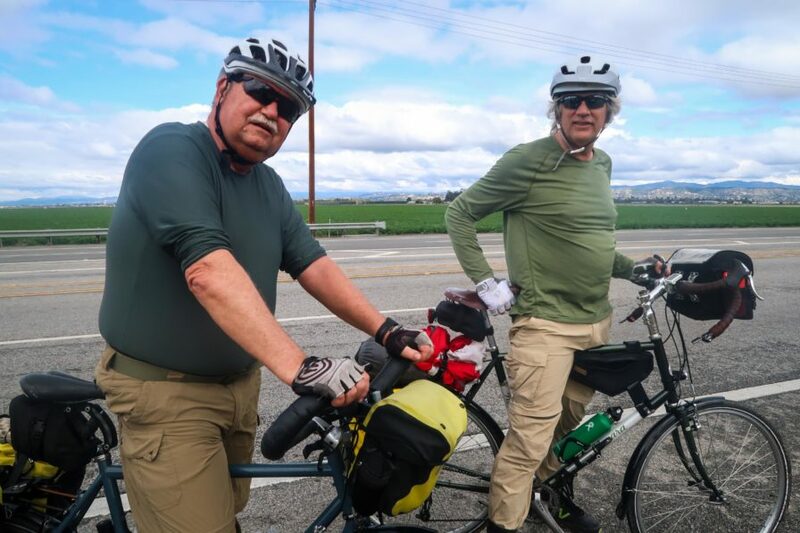 Here’s a quick recap of the “Bikes & Burritos” overnight bike tour: We started the tour around 1:00 PM on Saturday, March 10th at my parents’ home in Southern California. 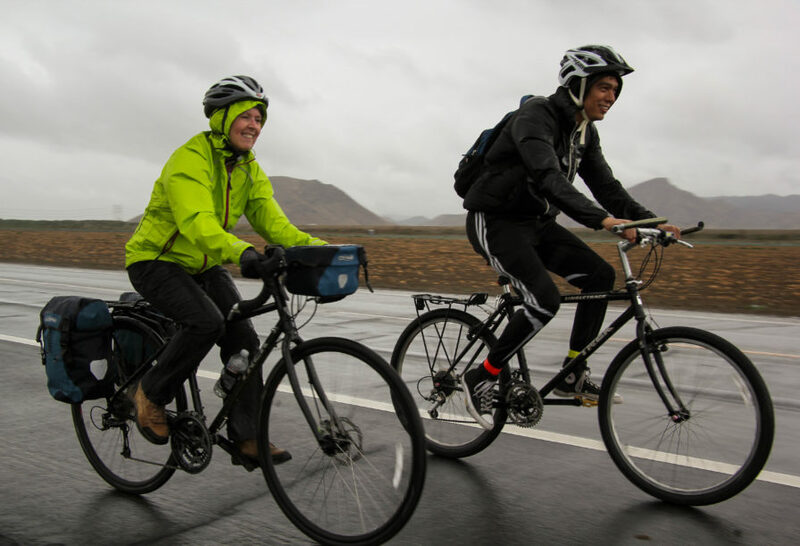 Everyone brought their own bicycle, camping gear, rain clothing, etc… and once we were all ready, we took off on our bikes. 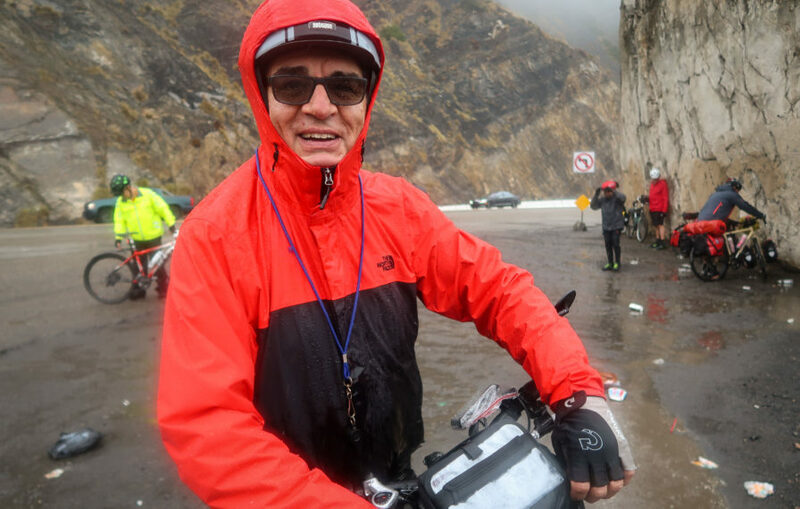 It was raining from the very start of the tour, so having a good rain jacket was a must on this first day of the ride. 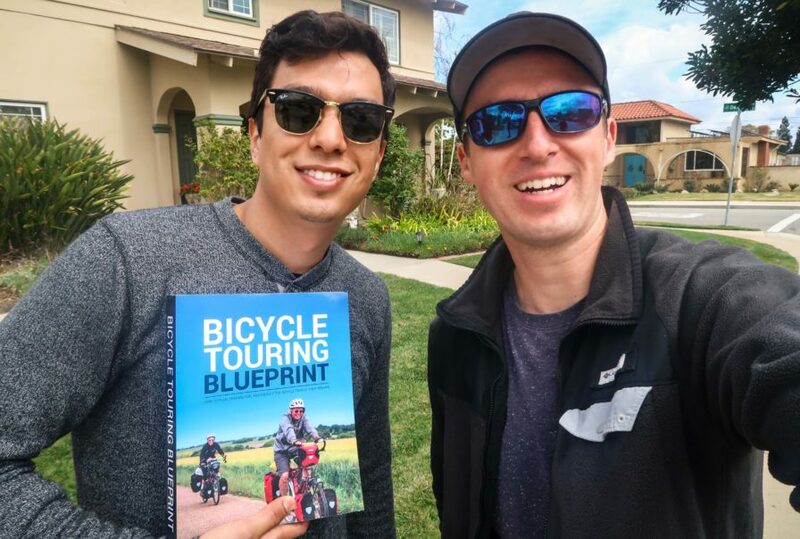 We started by cycling down Camarillo’s one and only separated bike path, making our way through the “Village at the Park” and then began cycling south down Lewis Road toward the California State University Channel Islands. 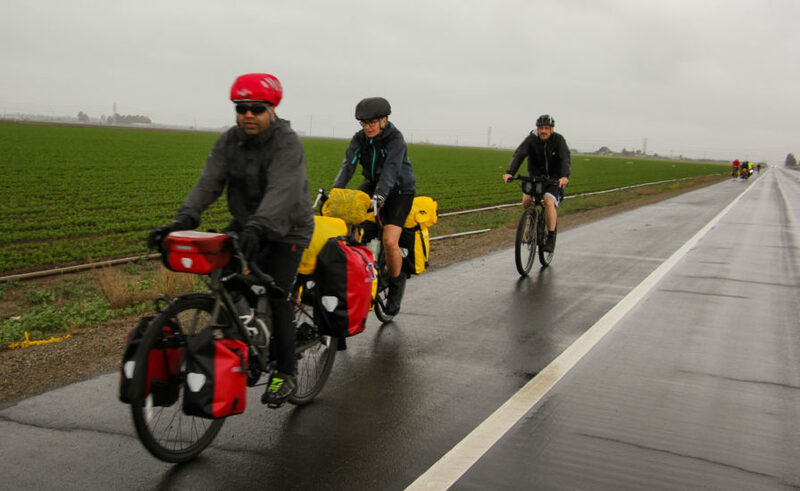 Along the way we cycled past massive fields of strawberries – something this region of Ventura County is well known for. Off in the distance and through the clouds, the Conejo Mountains made for a scenic view as we slowly pedaled our way toward the sea. 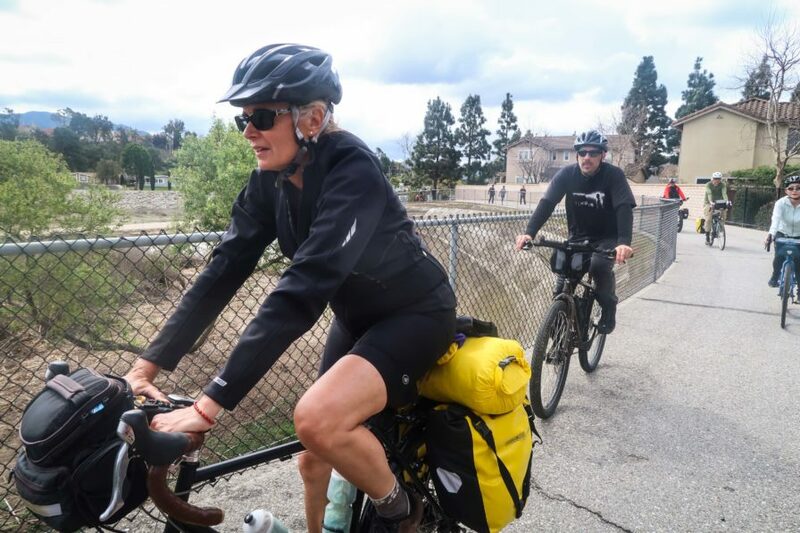 Some of the people who joined the “Bikes & Burritos” overnight bike tour were experienced cyclists who had done at least one or more long-distance bike tours on their own. 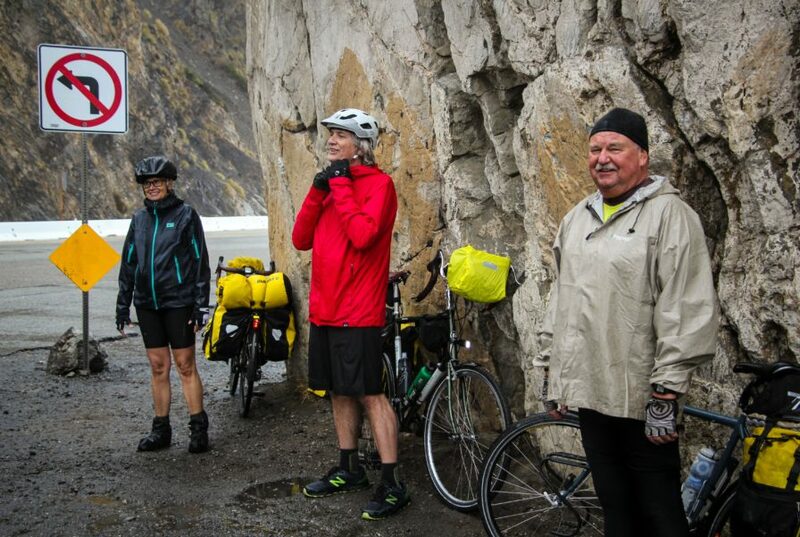 Whereas others in the group had never done an overnight bike tour at any other point in their lives! 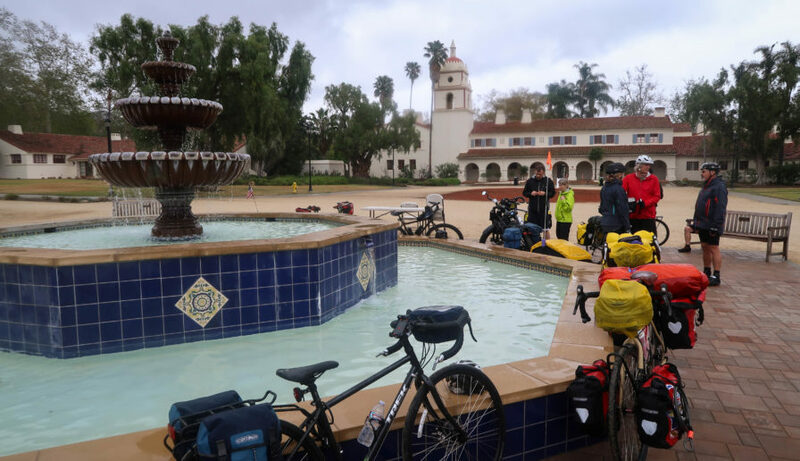 During a short lull in the rain, we stopped at the California State University Channel Islands for a short bathroom break. While we were there, we snapped a few photos, chatted with the others in the party, and then continued on our way. Pictured above from left to right: Darren, Hoang, Rao, Graham, Ben, Cindy, Uyen, Gregg, Michael, Audrey, Rory, Roy, Manuel and Adam. Of course, as soon as we started cycling again, the rain began to fall again as well. Now about half-way to our destination, we began to cycle a bit faster, as we were anxious to get out of the rain and reach the safety of the campground. 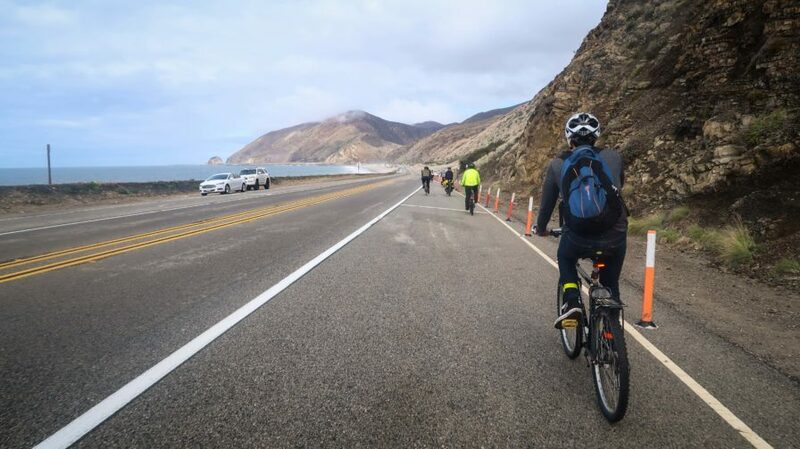 We eventually turned onto the Pacific Coast Highway and began cycling south toward Malibu. Along the way, we made a short stop at Mugu Rock, which is a large chunk of stone positioned between the road and the sea and is featured in numerous car commercials, movies, and advertisements. It was raining pretty hard at this point and our view of the Pacific Ocean was far from ideal, but we made the most of our time there and then continued down the road. The Sycamore Canyon campground was just a short distance away! Even though we only cycled approximately 20 miles during our first day together, it felt like a lot more because of the rain. 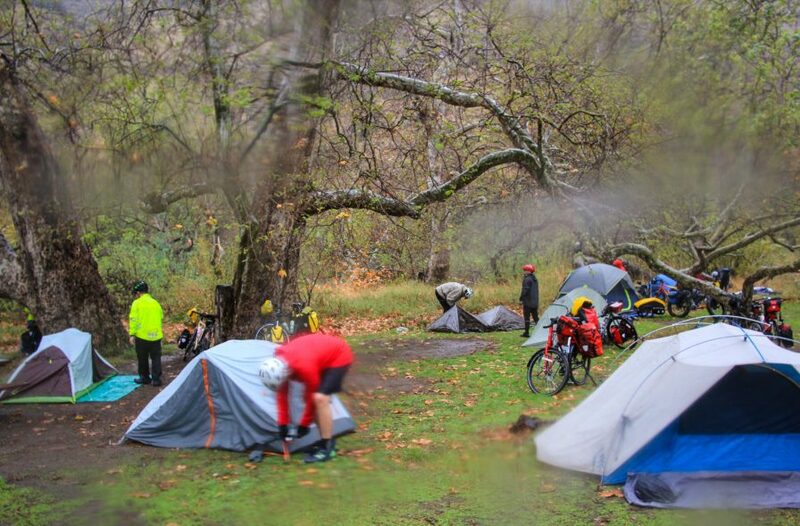 So, when we arrived at Sycamore Canyon campground, we quickly went to work on setting up our tents and changing into dry clothes. For some of the people in our group, this was their first time ever setting up their tent… and for others it was their first time ever camping in the rain. There are no pictures from the evening, because it got dark fast, but we spent the night sitting under a large white canopy that my parents had erected in the campsite before we arrived there. We made a campfire, conversed with one another and did our best to stay both dry and warm in the wet weather. Around 6:30 PM, my parents delivered hot burritos from Chipotle to the campground and we devoured the Mexican food quickly. Then, in the evening, we all went to sleep in our individual tents. After a short and rainy night in our tents, we woke the next morning to find that the rain had stopped. 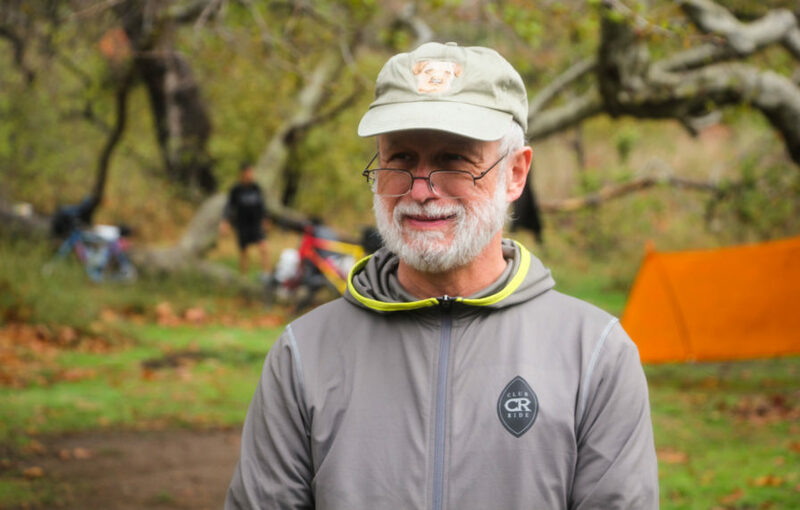 Gleefully, we crawled out of our tents, ate a quick Continental breakfast, packed up our bicycles and prepared to hit the road again. Before leaving the campground, we all posed together with our bicycles in the campsite. Then we took off, back up the Pacific Coast Highway, in the direction we had come from the day before. 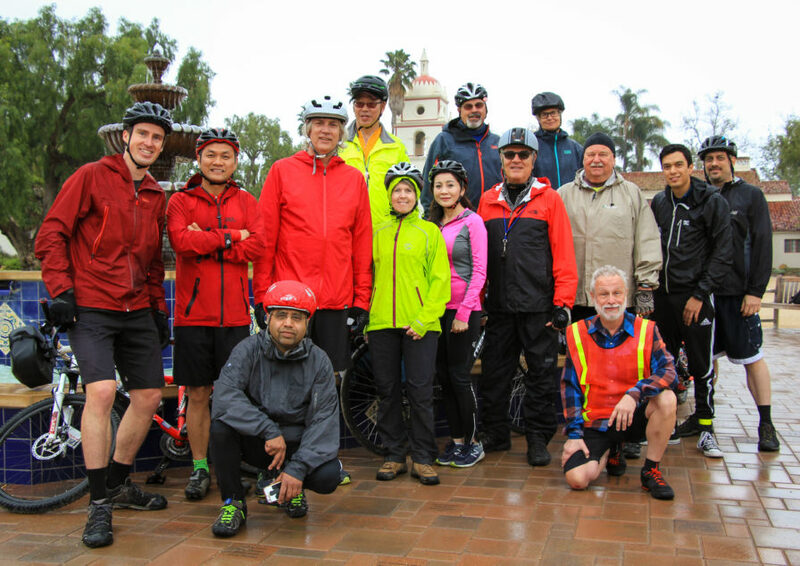 The weather was a whole lot nicer during the ride back to Camarillo on day two of the “Bikes & Burritos” overnight bike tour. The sun was out, it was dry, and even though the wind was blowing in our faces just a little bit, I think it’s safe to say we all enjoyed the cycling on day two a whole lot more than we did on day one. Once we were back in Camarillo, we skirted our way back to the dedicated bike path that runs from the south to the north side of the city. Then we cycled west, back to my parents’ house in central Camarillo… and it’s there that the bike tour came to an end. Once we had arrived back at my parents’ house we said our goodbyes, packed up our bicycles and everyone went their separate ways. I signed a few of my books… and then the first ever “Bikes & Burritos” overnight bike tour was officially over. Thank you to all 13 people who came out and participated in my first organized bike tour. It was so great meeting you all and I hope that we can stay in touch in the future! 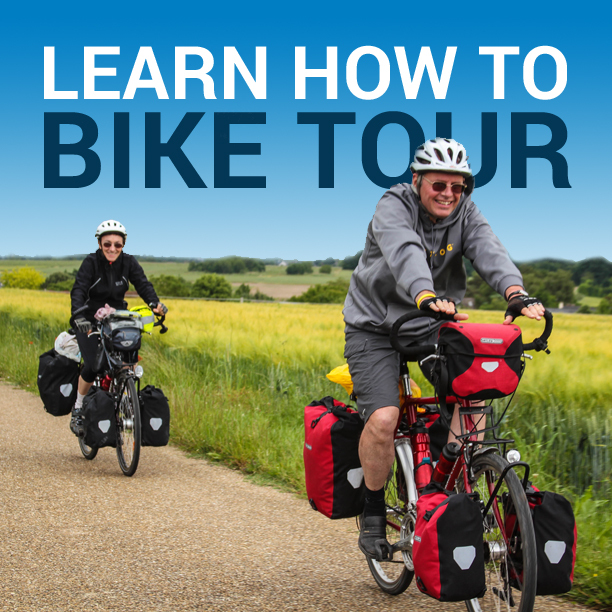 If this looks like the type of short, overnight bicycle tour you’d like to participate in at some point in the future, be sure to check out all of Bicycle Touring Pro’s upcoming events. Who knows!?! The next “Bikes & Burritos” overnight bike tour might just be taking place in your neck of the woods! 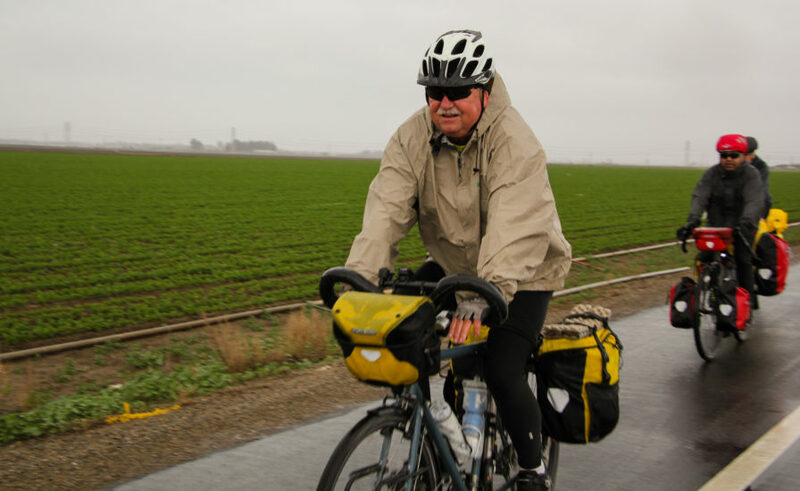 This entry was posted in Bicycle Touring Pro Articles, California, Darren Alff's Bike Tour Blog, Featured Articles, Main Articles, Main Featured Articles, North America, Uncategorized, United States, Videos and tagged beginner bike tour, bicycle tour, bicycle touring for beginners, bicycle touring pro, bike tour, bikes and burritos, cycling, cycling events, easy bike tour, local cycling event, overnight bike tour, socal bike tour, southern california bike tour. What a pitty, I love these type of journeys very much, but I have injury in my knees?. 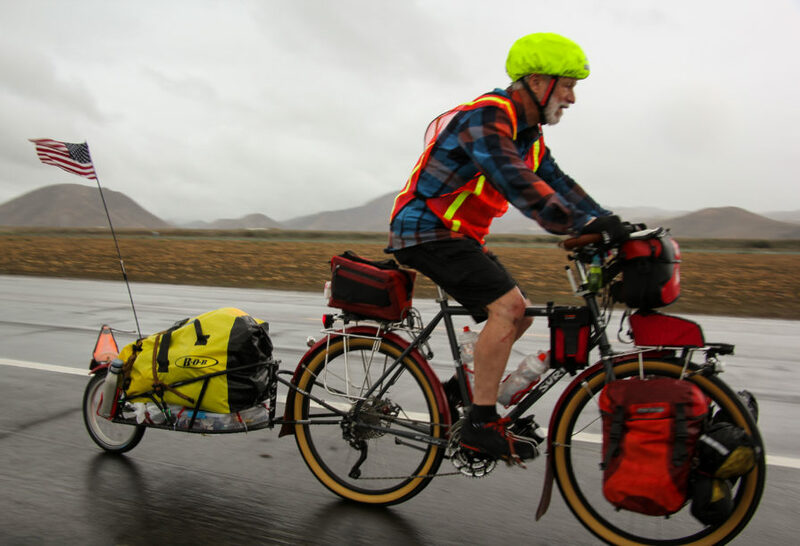 My husband arrived from his recent tour cycling across the Caspian sea in northern IRAN. ?